Fans of “The Good Place” who were in attendance at the NBC comedy’s San Diego Comic-Con 2018 panel on Saturday saw the first two minutes of the upcoming third season on Saturday. That includes TheWrap, so we can tell you exactly what happens. If you wanna know, proceed at your own risk. The clip opens with Michael (Ted Danson) coming through a door onto a giant bridge in the middle of a black abyss. He walks all the way down it toward the guard at a desk, with the title “The Guard.” How appropriate. “This is wild! I had no idea this was even here,” he says. The architect of everyone’s favorite Bad Place explains to the grumpy man that he’s heading down to earth to reverse four deaths — clearly, he’s talking about Eleanor (Kristen Bell), Chidi (William Jackson Harper), Tahani (Jameela Jamil), and Jason (Manny Jacinto) — and that it’s going to be a “kinda tricky” ordeal that will affect multiple timelines. The guard really doesn’t care, but explains to him once he goes through the door at the end of the bridge, he’ll be on Earth, sans powers. Wait, that means he’ll have to ride a bus? Yes! Michael is very pleased by this, and immediately hopes he gets a front-facing seat. No! Maybe a sideways-facing seat? It doesn’t matter, either way he obviously can’t wait to enjoy the miseries of humanity. Then he tries to grab a key attached to a frog keychain on the desk No! What the heck, Michael? The Guard informs him he is the only one who can use this all important item, which is the key made of very first items that came into existence. It also states very clearly on the key that it “cannot be duplicated.” (We can only assume this will be important later in the season.) Michael asks what the “significance” of the frog is here. Oh, there isn’t one, the guard just likes frogs. He then hands Michael a device and tells him to press a button on it to return. Any questions? Nah, Michael is good. The demon then steps through the door and we immediately see the scene in which Eleanor embarrassingly died in front of a grocery store back in Season 1, thanks to a giant stack of runaway shopping carts that slammed into her in a parking lot. 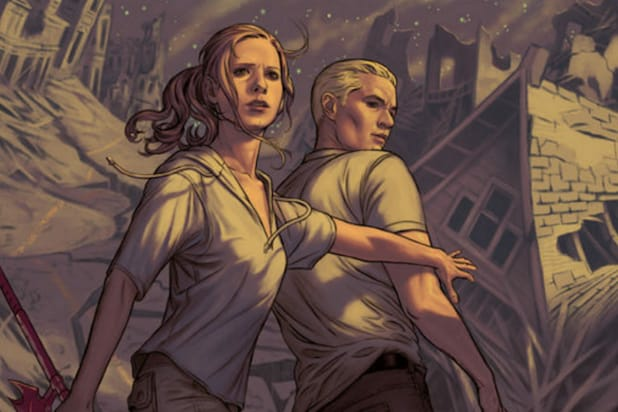 Only this time, a mysterious figure (Michael, obviously) comes out of nowhere and pushes her out of the way. She’s saved! But the stranger has disappeared as soon as she turns around to look for him. Then flash, Michael is back through the door standing next to The Guard, talking about how amazing Earth is. The traffic! The pigeons! Did you know there is a Pizza Hut that is ALSO a Taco Bell?!? His mind reels at the thought. And so does ours, cause that’s where the clip ends. As fans of the critically-acclaimed NBC series will remember, Season 2 ended back in February with a cliffhanger that rivaled the first year’s it-was-the-bad-place-all-along twist — Eleanor, Chidi, Tahani, and Jason were sent back to Earth by Michael to prove they’ve learned to be good enough that they can enter the real Good Place. Schur also confirmed at the time that though the crew will be back on Earth during Season 3, we will still see them interacting with Michael — Janet! (D’Arcy Carden) — regularly. And now it looks like we know how the supernatural beings will get back and forth from there. 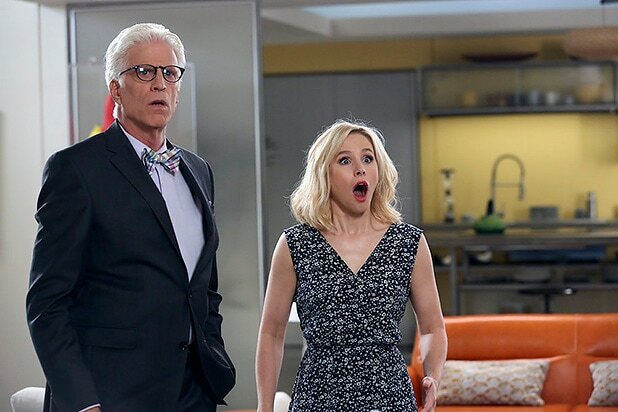 “The Good Place” returns with a one-hour premiere Thursday, Sept. 27 at 8/7c on NBC.